To prepare learners well for the future by developing their skills, knowledge and understanding in a high quality learning environment. Having successfully maintained Investors In People accreditation for several years, South Lanarkshire College is now one of the small number of organisations in the UK to have achieved IIP Gold standard. We actively encourage staff to continually develop their professional knowledge and skills. 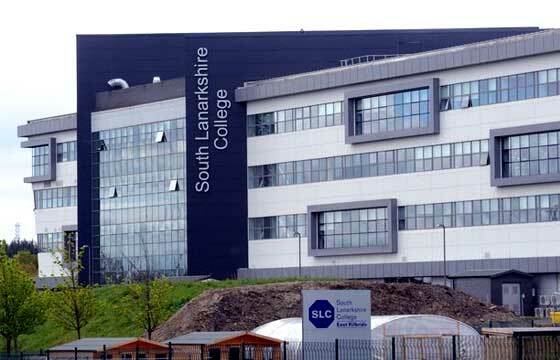 Communication, consultation and participation in decision making are fundamental aspects of the College approach to Human Resource Management.South Lanarkshire College is a public funding institution. East Kilbride is the best of both worlds : close to the cosmopolitan cities of Glasgow and Edinburgh but also has beautiful countryside close by. Scotland is an excellent provider of education and training, offering a gateway to students from around the world to enhance their learning whilst developing their understanding of western culture and business practices. You will be accompanied to your accommodation and shown to your room. Staff will be there to explain how to use appliances etc and a 'welcome pack' of essential foods will be provided. The accommodation contains 6 single study bedrooms, sharing kitchen/living room, 2 shower rooms and 2 toilets. Some flats are adapted for students with disabilities. Each bedroom is attractively furnished and centrally heated, offering a comfortable living environment. The flats are minutes away from Hamilton town centre which provides a range of sporting and leisure facilities such as football, rugby, golf, tennis, ice skating, cycle hire, horse riding, ten pin bowling, and water sports. There is a swimming complex opposite the flats. We have a wide range of programmes in offer which lead to HNC or HND qualifications.Our most recent HMIe report concluded that teaching and learning at the College are of an excellent standard.South Lanarkshire College's reputation for quality is outstanding. Scottish qualifications are recognised and respected worldwide.Our staff are always on hand to help you when you need us. We are committed to providing you with a positive, enriching experience.Our new building is state of the art and offers outstanding teaching and learning facilities.